A natural decline in reproductive hormones when a woman reaches her 40s or 50s. 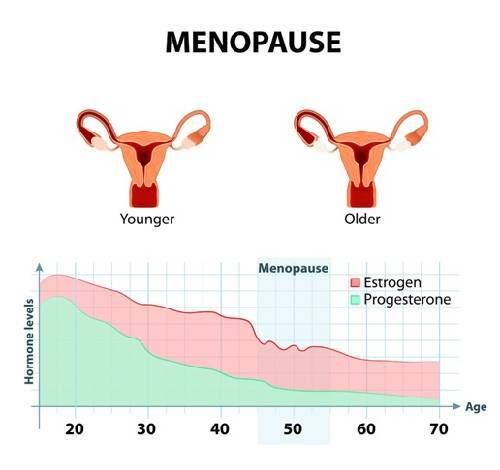 Menopause marks the end of a woman's menstrual periods. A woman has officially gone through menopause when it has been one year since her last period. In the months to years before menopause—a time called perimenopause—the production of hormones that regulate the menstrual cycle changes. Women are also more likely to develop depression for the first time or have it recur. Some women report trouble with memory and the ability to concentrate. There are effective ways to deal with some of the symptoms of menopause. Irregular periods. Low-dose birth control pills are an option for nonsmokers. Use of progesterone-like hormones also can help control heavy, irregular bleeding. Vaginal dryness. Over-the-counter vaginal moisturizers can relieve dryness. Hot flashes. Many women can manage hot flashes with self-help approaches like beginning deep-breathing exercises at the beginning of a hot flash, wearing loose, comfortable clothing and dressing in layers, keeping the work place and home —especially the bedroom — cool. Taking estrogen or other hormones can be safe and effective for short-term relief of symptoms like hot flashes and night sweats—provided it’s prescribed with a woman’s individual health in mind. Hormone therapy is also effective for preventing osteoporosis in women at high risk .